Need mailboxes? You’ve come to the right place. 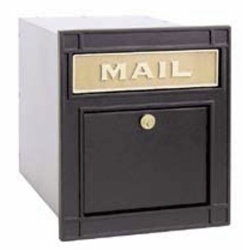 U.S. Mail Supply has a staggering assortment of mailboxes for residential and commercial use—everything from single box units for home use to wall or pedestal mount mailboxes for buildings with hundreds of occupants. And since you’re in a state with a bit of a reputation for inclement weather, you’ll be pleased to know we only carry top quality, American-made mailboxes build from steel and aluminum. In addition to mailboxes for indoor or outdoor placement, we also carry drop boxes, key holders, trash receptacles and even boxes designed for depositing bags of doggy doodies. Everything we carry is built to last through years of hard use and nasty Minnesota winters. Our prices are the best you’ll find anywhere, and we ship to all parts of Minnesota. Email and texts may have put a dent on the amount of correspondence businesses send via the Postal Service, but good old fashioned mail is still alive and well. Whether you’re a small, home-based business or a major corporation, U.S. Mail Supply has plenty of options for you to consider—including both USPS approved mailboxes and private use only mailboxes. 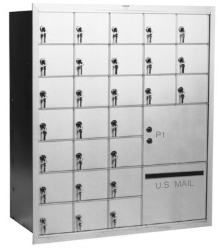 The venerable 4C horizontal mailbox is the most commonly installed mailbox in buildings with multiple tenants. We have these in a huge ranges of sizes and colors, and offer custom configurations with the assistance of our design staff. Whatever the size or shape of your mailroom, we make it easy to get just the right configuration. If you need a mailbox for postal deliveries and pickups, you need a USPS approved mailbox. The easiest way to ensure your mailbox meets Postal Service regulations is to order one that’s already been approved by the USPS. We have a mind boggling selection of USPS approved mailboxes, and all come with installation instructions to ensure compliance with postal regulations. Even in a state that prides itself on how nice its people are, there are bad apples. Increasingly, they’re venturing into mail and package theft. 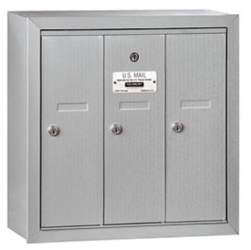 While no mailbox can be completely secure, the heavy-gauge steel and aluminum apartment mailboxes we carry are your best defense against mail theft. They’re all equipped with secure locks and vandal resistant finishes. 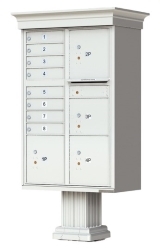 Outdoor pedestal mount mailboxes are a popular choice for many businesses, schools, government buildings and multi-unit residences. 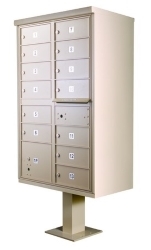 We have a great selection of both USPS approved and private use only mailboxes, and offer custom configurations with options for package lockers, key holders and oversized mailboxes. Compared to outdoor mailboxes, indoor mailboxes have it easy. Still, you need a well-made mailbox to withstand the daily wear and tear. U.S. Mail Supply only carries quality, American-made mailboxes built with heavy-gauge steel and aluminum. We offer both USPS Approved and private use only mailboxes, with deep customization options. Whether you’re a home owner or a home builder, U.S. Mail Supply is your best source for quality, American-made mailboxes. Sure, you can find something cheaper, but are you really saving any money if you have to replace your mailbox in a couple of years because it’s falling apart? When you buy a mailbox from U.S. Mail Supply, you only have to buy it once. 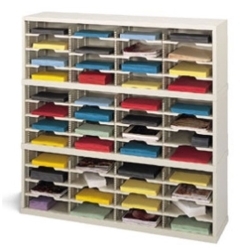 Mail sorters aren’t just for keeping mail rooms organized, they’re also for keeping documents, brochures, forms and paper stock organized. U.S. Mail Supply has mail sorters of all types—open back, closed back and even HIPAA compliant sorters for sensitive documents. They’re all high-quality, formed and welded steel, and built in America. 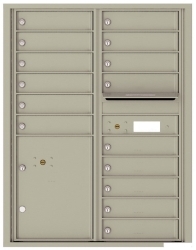 Whether you’re a property manager in charge of procuring mailboxes for a multi-unit building or a small business looking for a single, wall-mount mailbox, U.S. Mail Supply is where you need to be looking. We specialize in high-quality, American-made mailboxes built to withstand the worst that Mother Nature and mankind can dish out. With so many mailboxes to choose from, most with deep customization options, figuring out which will work best can be confusing. If you have questions, or need help figuring out what mailbox to order, just give us a call. Going through page after page of mailbox configuration options isn’t for everyone. 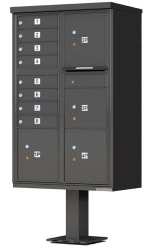 That’s why U.S. Mail Supply offers free design assistance for custom mailbox configurations. You can get started by clicking on one of the two options below. Just fill in your responses to the questions about the type of mailboxes you need. After you submit a completed form, our staff designers will create a rendering of how your mailbox installation will look. Along with that, we’ll send you a price quote.